"Fatbergs" — a portmanteau that combines "fat" & "iceberg” — are giant masses of hardened fat, grease, and household garbage that clog sewer systems. A 210-foot-long fatberg, which is longer than the Leaning Tower of Pisa is tall, was recently discovered in the sewers under Sidmouth, a coastal town in Devon, England. This fatberg is only a quarter of the length of the one discovered in London in 2017. Imagine holding a massive, squishy beach ball, except instead of colorful plastic, the ball is made of used condoms, wet wipes, crude oil, and congealed cooking fat from people's morning bacon. 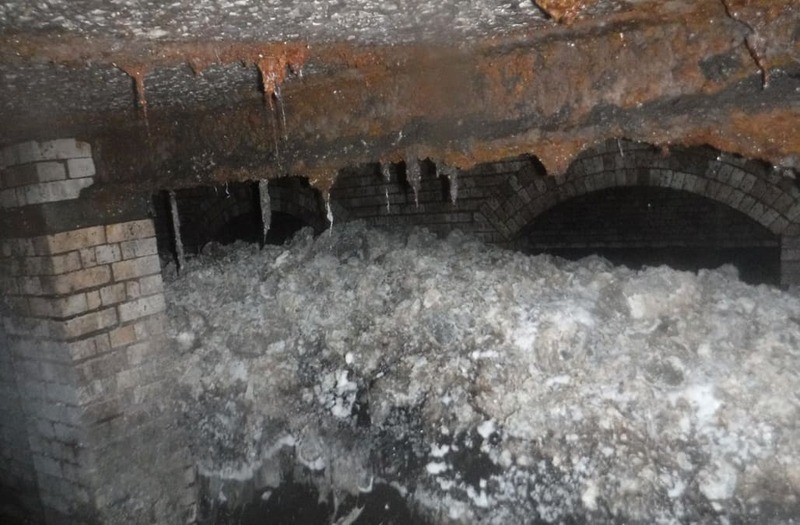 That's a fatberg, and it's what sewer workers in London encounter with regularity. In 2017, a 150-ton, 820-foot-long fatberg was discovered in the sewers beneath east London. A piece of that record-breaking fatberg was put on display in the Museum of London, where it then started growing toxic mold pustules and even hatched flies. The Thames Water Authority told the AFP in 2014 that it saw nearly 80,000 fatberg clogs annually, which cost $1.6 million per month to get rid of. Almost 7,000 water authority customers experienced flooding as a result of these blockages. Now, a 210-foot-long fatberg has been found blocking a sewer in Sidmouth, England, a small coastal town. The blockage is longer than the Leaning Tower of Pisa, stretching more than six buses would if lined up end to end. A team from South West Water, the company that provides drinking water and wastewater management throughout Devon, England, is now figuring out how to remove the blockage. Andrew Roantree, a worker with South West Water, told the Associated Press that it will take the crew "around eight weeks to dissect this monster in exceptionally challenging working conditions." The removal is scheduled to start February 4, but could be delayed due to heavy rain, according to a statement from South West Water. The statement also encouraged consumers to "stop the block by only flushing the 3Ps — pee, paper, and poo — and by not pouring fat, oil, and grease (FOG) down the drain." South West Water noted that the fatberg "has been discovered in good time," so didn't impact the quality of local tap water. Fatbergs are difficult and expensive to eliminate. When people pour leftover grease from cooking down the sink or flush wet wipes down the toilet, those waste products aggregate in wastewater and sewage systems. Workers then have to break them up using pickaxes or shovels, or blast them with high-pressure water jets. The blockages aren’t limited to British soil. The fight against fatbergs is worldwide, with cities like Melbourne, Australia and Baltimore in the US uncovering big ones, too. New York City spent $18 million over five years fighting fatbergs, according to National Geographic. “The United States and United Kingdom report the most fatbergs,” engineer Thomas Wallace, an engineer at University College Dublin, told National Geographic. He noted that these countries produce an abundance of ingredients that create fatbergs — Forbes reported that Londoners produce between 32 and 44 million liters of used cooking oil a year. Aging sewers systems are also to blame, since they aren’t capable of dealing with a large population's trash habits. Fatbergs can't be left to languish, because the mess can stick to sewer walls and harden. When these blockages solidify, they effectively become balls of concrete that fill the pipes and no longer let sewage pass through. These obstructions sometimes cause sewage to ooze up through manholes or back up into drains in homes. The domestic back-flow can contaminate household water supplies, which poses a risk to human health. The blockages can also cause flooding that damages property or contaminates nearby bodies of water with sewage, according to a 2017 study. South West Water said tackling sewer blockages in Devon "adds £4.5 million [$5.75 million] to bills every year."